Acoustic Songwriter | Live Performer or DJ for any event. Serving Phoenix and East Valley Areas. From backyard parties and open houses to professional corporate events and weddings, your gathering will be remembered for the festive live music. 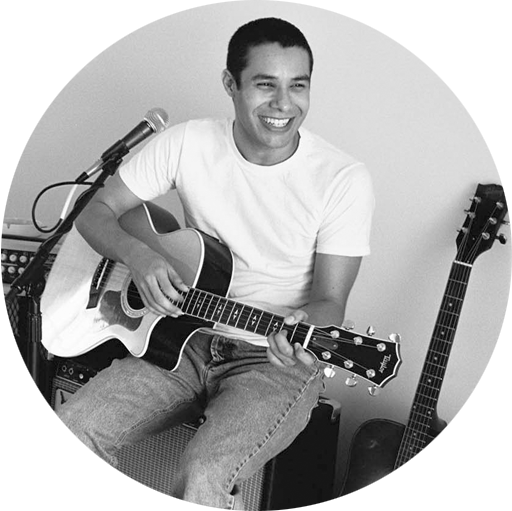 An award-winning composer and performer, Huge brings a lively mix of classics and current pop songs to your event, all performed with a twist of acoustic guitar, loops and harmonies, sure to entertain any crowd. A fun-filled performance of up to two hours may be booked, complete with a cutting-edge sound system able to fill any size venue. Have a special song you’d like played specifically for your event? Huge will learn it for you! Call or fill out the contact form to book now. An assortment of popular songs from current pop hits to one hit wonders of yesteryear, all performed live with acoustic guitar & loops. Whether relaxing cocktail hour favorites to set a background mood or pounding club hits sure to fill the dance floor, we have you covered. A night of unforgettable Karaoke for your event is sure to leave everyone feeling like a star. All performances are able to be recorded! Questions or need a quote for your event? Feel free to contact us using the form below. Or call us directly to discuss your needs.